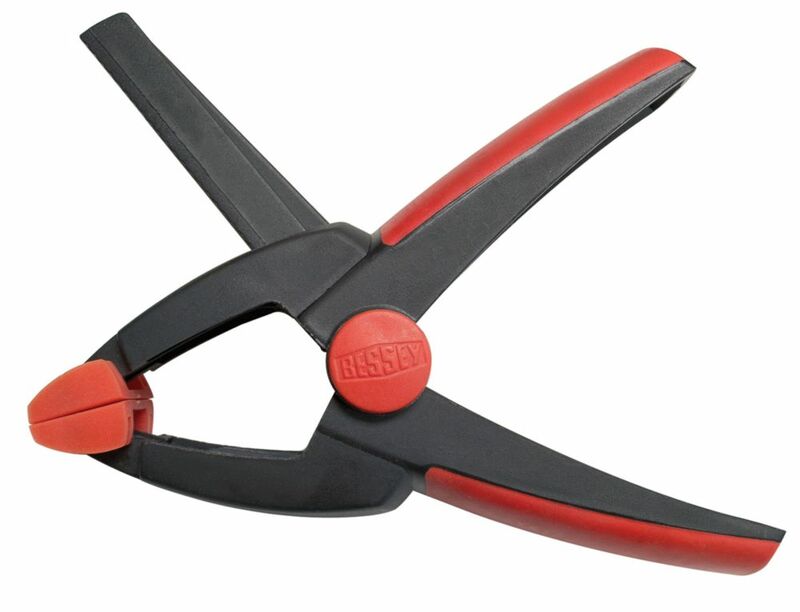 This one BESSEY variable spring clamp does the work of four traditional spring clamps. Ergonomic composite handle designed for comfort while clamping. Non-marring pads to protect delicate work surfaces. 4 Inch. Variable Jaw Plastic Composite Spring Clamp With 2 Inch. Throat Depth If one wants to get more functionality out of their spring clamps then, one should consider the BESSEY VarioClippix. BESSEY engineers have combined sliding arm technology with the common spring clamp to create this very unique and effective tool. With a handle that approximates the grip size of a 2 In. spring clamp, this unit has the jaw capacity to do the work of a 1, 2, 3 or 4 In. spring clamp due to its variable arm function. It can be adjusted upwards or downwards as required dependent on the work piece. This feature also allows one to vary the clamping pressure. 4 Inch. Variable Jaw Plastic Composite Spring Clamp With 2 Inch. Throat Depth is rated 4.9 out of 5 by 7. Rated 5 out of 5 by ALS from I build furniture, and these are perfect for hold pieces... I build furniture, and these are perfect for hold pieces of wood in place. Don`t always need the big clamps. Rated 4 out of 5 by Bryan from I used the clamps to keep a tarp on my... I used the clamps to keep a tarp on my outdoor table. They have only been on a couple of weeks so I really don't know how well they are going to stand up to being on all winter. Rated 5 out of 5 by Jaime from great clamp I don't know much about tools but this clam did the job! Rated 5 out of 5 by MB from A staple in the toolbox I had been shopping around for clamps for quite some time but needed something with serious holding power. This is it. Not only does it have the required force to hold objects together, it is adjustable for use on wider/larger pieces. I decided to go with this clamp for that reason and I have already used it to hold ice bucket parts together while super glue set. It was a bit tricky to get the adjustable jaw to move the first time as there were no instructions but once I figured it out, its not a problem.